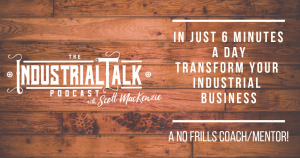 The Industrial Talk Podcast with Scott MacKenzie, The Voice of Industry! "Don't Care About Industrial Marketing? What You Need To Know About Industrial Marketing, Sales and Branding. Business to Industry (B2I) Industrial Marketing is vital to your company’s long-term success, legacy, lead generation and market growth. Done strategically, B2I Industrial Marketing will add significant value to your bottom-line. Industrial companies must recognize that these marketing investment trends will exponentially grow over time. Companies who understand this will have a strategic and competitive advantage in the Industrial Market. The power of these top-trending marketing platforms proves itself when properly aligned with your company’s overall strategic vision. It is a Proactive Alignment that naturally morphs into a living, breathing, Industrial Marketing Approach whose oxygen is Lead Generation followed by Responsive Action. Proactive Alignment results in a powerful marketing funnel giving you a commanding advantage over your Industrial competitors while better serving your current customers. Your company then has the right tools to interest prospects and increase market reach. B2I Industrial Marketing effectively aligns the following 6 marketing strategies to ensure a clear and cogent message. In many industrial companies, the Industrial Marketing strategies are out of alignment. This means that messaging is not consistent across the 6 marketing disciplines. The right hand doesn’t know what the left hand is doing. Additionally, effective assessment of each marketing strategy is not tracked. A tracked strategy GROWS! Find out more and get your FREE Industrial Market Assessment! Podcasting is a powerful content generation machine. Done correctly, it effectively creates a Know/Like/Trust/Caring relationship with your customers and prospects. The podcast platform is a true Win/Win for your customer/prospect and your company. In short this is an exposure engine! It shares and highlights the Human side of your company and your customer. Humanizing stories permanently connect you with your audience! Remembering your story means they remember YOU and YOUR COMPANY. This is an Industrial Content game changer, truly one of the biggest advancements ever for podcast guests! Heck, even the hearing impaired can now find your podcast interviews! Exposure brings opportunity and this just massively improved your exposure for podcast platforms, for you, your customers and targeted prospects - Powerful! Your ideal customers and prospects are listening and searching. Will they find you or your competitor? We at Industrial Talk are 100% dedicated to Your Industrial Success and Legacy. All Industrial-generated content focuses on YOU by delivering cutting edge, strategically effective Industrial Marketing solutions to solve today's Industrial Market challenges. Let us provide your personalized influential content platform that expands your Industrial reach, your influence and your bottom line. Believe it or not, it’s not about you and your company…It is completely and fully about your customer's success. Your services and solutions should be 100% focused on solving problems or providing gains for your Customer or Prospect. They are the Heroes in your story; you are the Sidekick and without them, you don’t exist. The goal is to provide your Industrial Hero with the right tools for success. Unfortunately, the majority of our time revolves around Handling Concerns and Closing, but the big secret is that success in Industrial Sales rotates around Establishing Trust/Respect and Understanding your Customer’s Pain and Desire for Gains. What if more time were spent building that strong foundation of understanding? Handling concerns then becomes a strategic conversation based on the assumed conclusion that we’re ALREADY a team working together! The Hard-Sell turns into “How can we help you?” What could have been an adversarial sparring match is now the first step in a new business relationship. As this question: How do you Establish Trust and Respect? Industrial Talk's portfolio of marketing solutions can effectively establish Trust and Respect with your Industrial Customers and Prospects. Branding is a term more often heard in the direct-to-consumer markets. With the advent and growing power of digital marketing, branding one’s personal creations and home businesses is a snap. But…what about the Industrial Space? Why does the end-consumer need to know and see the face of Industry? Why can’t Industry continue as its always done - Produce a good product and it will sell itself! Why must we personalize our contributions to the Industrial markets when nobody really cares anyway? Why does Industry need to label itself for the masses to see? WHY? WHY? WHY? BECAUSE DIGITAL MARKETING IS THE GREAT EQUALIZER! A small company can look bigger and better than it really is based on its branding, creating competitors you never knew you had! Two reasons Industrial Businesses Fail: 1. Obscurity and 2. You are Forgettable! Industrial Branding strategies ensures a level of "Status" with your Customers and Prospects. Customer's want to be on a Winning team. Industrial Branding removes you from the sea of Industrial Sameness. Industrial Marketing contributes to a smarter, more market-savvy customer base. Branding is your company’s Calling Card. Customers can find what they need ANYWHERE, ANYTIME, no longer confined by geography and limited communication. If a prospect can’t see who you are INSTANTANEOUSLY they will go elsewhere! Digital Marketing makes the world a smaller, more familiar place. Your prospective customers want to KNOW YOU because they will know your competitor. If your competitors share their up from the bootstraps/rags to riches stories to brand themselves as the trustworthy service-provider, prospects will be naturally drawn to them because their story is familiar and admirable. If your Branding story isn’t out there, you LOSE. IT’S ALL ABOUT THE RESEARCH, BABY! Prospects can get their hands on industry stats and competitive research INSTANTANEOUSLY. They can now know more about your company than you do before the first contact. If you haven’t branded yourself, your prospect is CLUELESS about who you are and what you stand for. In order to be competitive, know your prospect, understand their unique needs and concerns, have them know you and your company’s vision, BRANDING through Digital Marketing is a NON-NEGOTIABLE. Why Is Content Development Important to Industrial Marketing? Content Development is a fancy term for telling your company’s Industrial story, but it isn’t a one-time hit like a college textbook, never to see the light of day again. It is an ON-GOING JOURNEY taken by you and your customers, prospective and current. Content Development becomes the reference library for those wanting to know more about you and your company. They can dive into your Content to find what they need to know about YOU, a tremendous time-saver for you and them. Want to SET YOUR COMPANY APART from the Industrial Herd? CREATE CONTENT THAT SOLVES PROBLEMS! Content Development IS the helping hand extended to your prospects inviting them to join the journey, YOUR journey. Too touchy-feely for you? Doesn’t have to be! Think of it as conversational advertising that builds loyalty and trust rather than just a quick, one-time glance at a half-time commercial. Lastly, Content Development is essential for putting YOUR COMPANY’S GROWTH on display. Digital Marketing has eliminated guesswork. Prospective Clients will SEE and UNDERSTAND who you are because they become part of your story, your future timeline of growth and expansion. Current Customers are uplifted and elevated because they are already essential contributors. They SEE, FEEL and UNDERSTAND that they are IMPORTANT TO YOU. Here is an Industrial sales truth bombs: 1. 93% of online experiences begin with a search engine. 2. 81% of people perform some type of online research before making a large purchase. 3. 75% of people never scroll past the first page of search engines (Junto, April 8th, 2019). Bottom-line, if you are not on the first page of the search results you are losing opportunity and sales. What to do??? Industrial SEO is vital to all your Industrial Marketing efforts! If you develop a fantastic product that is both innovative and cost effective to the Industrial Market but you are on the second or third page of a search result, you will go unnoticed! Your Industrial Marketing efforts, Podcasts, Videos, Content Development and Blogs will go unnoticed. In short you fall into the land of Obscurity and You Are Forgettable! You will have a harder time fulfilling your Purpose of changing the world and helping Customer's Succeed. Industrial SEO strategy must be implemented today! The longer you wait gives your competition more time to be on the first page of a Google search result. One last stat, 60% will "Click" on the first 3 results on the first page. THIS IS A MUST! This is an Industrial no-brainier! Industrial Marketing Technology allows you and your team to do more, to be more efficient and effective in implementing and sustaining your Industrial Marketing strategies. Technology starts with your website. Is it "Static" or "Dynamic"? It is very important that your website is "Dynamic" and provides valuable content for your Customer's and Prospect's to succeed. Is your website connected to your CRM? This is the opportunity to collect Customer and Prospect leads. It is the beginning of your technical Sale Funnel. It provides the ability to perform targeted customer segmentation Marketing. Does you CRM provide automation solutions to nurture sales opportunities? Through an effective CRM solution, you can automate your interaction with Customers and Prospects 24/7, 365 and around the world. Are you utilizing Chatbots? Digital Robots? These solutions will provide a user experience that will surpass your Industrial Competition. Finally, are you pushing news and helpful articles to your Customers and Prospect? Work with a news aggregator to target articles for your Customers. This is a very nice thing to do for your Customer and continues to develop the Know/Like/Trust/Caring. Thanks for creating this much needed podcast for the industrial world. Too many industrial companies are not getting it - Scott will help you understand how to attract, engage, and win industrial customers today. We can't keep doing the same things and expect modern, empowered, educated buyers to pay attention. Learn from Scott and his guests how to move you business forward. Well done Scott! This podcast is full of energy. I listen to so many and some interviews are sometimes slow, not this one. Keep up the fantastic work! Two weeks ago I was Scott's guest for an episode of Industrial Talk. I've been fortunate to be on several podcasts and Industrial Talk is top shelf. Scott's passion for all things industrial is infectious and he's a true professional in what he does. Thanks Scott and Industrial Talk for promoting such a critical part of America's ecoomy in such an entertaining way. Scott is great getting actionable ideas from his guests that you can use to improve your business regardless of whether you own, lead or work in it. I had the chance to talk with Scott outside of the podcast to pick his brain a little more, and he was an absolute pleasure to work with! He was knowledgeable, very helpful, and generous with his time. Thanks again Scott! Scott undersands that manufacturing has moved into the 21st Century and that the same old same old won't work if you want to grow. He cuts right to the essence of the problem...and he's pretty funny to boot! The podcast is fun to listen to and it was fun to be a guest. Have a listen! 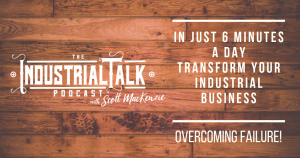 Scott MacKenzie is doing something unique to and despeately needed in the industrial marketplace...hosting podcasts with guests who deliver valuable advice and insights to help people and their businesses maximize their potential. His episodes are not only educational but very entertaining! The Industrial Talk Podcast is a great source of knowledge and information. Scott is very professional and did a great job with the interviews. On top of that he is a great entertainer. Thank you Scott for the great job! Very impressed with the show. Good content and Scott has a great interview style! Unique voice - a must listen! Scott's podcasts are not to be missed, he asks the tough questions, entertains while he informs, and cares deeply about delivering meaningful content! 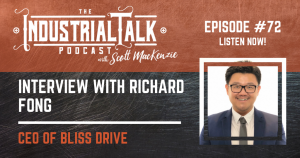 I had the pleasure of being interviewed by Scott MacKenzie on The Industrial Talk Podcast and I would recoemmend other who would like to spread their message to contact Scott and schedule an interview. Scott has a professional set up and does all the work to make it easy to promote the podcast on socila media, and he is fun to work with. Thanks Scott for a great experience and all the best. Scott is a skilled interviewer with a high energy level that keeps the show interesting and moving right along! His questions are insightful and allow great dialogue on the subject. The topics are relevant to the industry and The Industrial Talk Podcast brings inspirational information to listeners! Keep up the great job, Scott. Really enjoy hearing the different perspectives from industrial leaders. Thanks for all you do to promote businesses that drive towards higher standards. Anyone that says manufacturing is old and lagging, has never listened The Industrial Talk Podcasts. Scott MacKenzie introduces us to new ideas and new thoughts using podcast. In 5 years when everyone in this sector is doing podcasts, you can say "I remember hearing Scott from the beginning" - just go back and binge listen! Just listened to the first episode... it's amazing how much good stuff was packed into 15 minutes! Informative and encouraging. Industrial Talk needs your help in developing meaningful Industrial specific content that identifies today’s Industrial challenges and tactical solutions for Industrial success. Please participate in the Industrial Insight Poll and share your Industrial knowledge to help other Industrial Professionals succeed. Participate and receive FREE access to the Industrial Academy's online course in Industrial Branding Through Digital Platforms. Industrial Talk thanks you for your participation. Don't miss an episode or an article from The Industrial Talk Podcast. Sign up today and stay informed about what's happening in the industrial workplace. We are Industrial Talk. We believe in you and your vision, desiring nothing but your company’s success. Our team is talented, diversely-educated and 100% committed to providing the absolute best Industrial Marketing strategies to our valued clients. 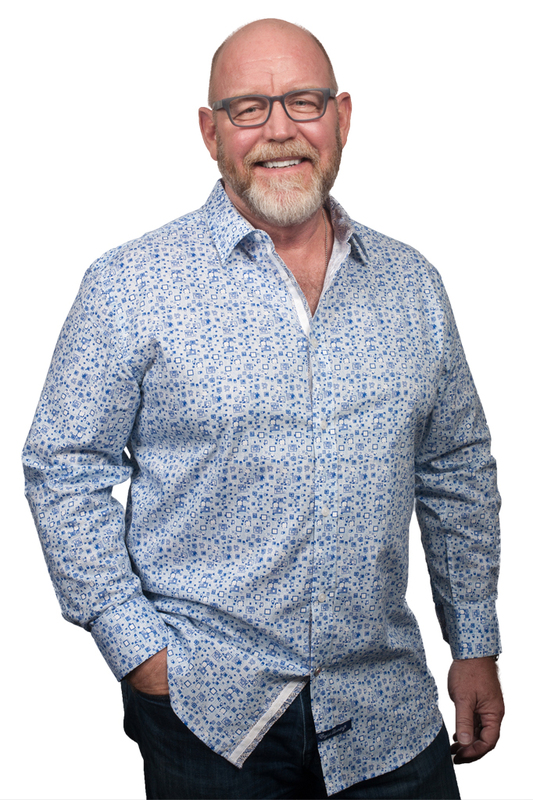 Our Founder, Scott MacKenzie, lives and breathes his passion for Industrial growth and success. His humble beginnings as a lathing contractor and certified journeyman/lineman gives him the field-cred needed to understand industrial challenges. His MBA and Post-Grad education opened the door to lead a team onto the NASDAQ while serving as President of a multi-national terminaling corporation. He leads a team of dedicated professionals, unafraid of out-of-the-box thinking and ready to serve the Industrial market with excellence and innovation.